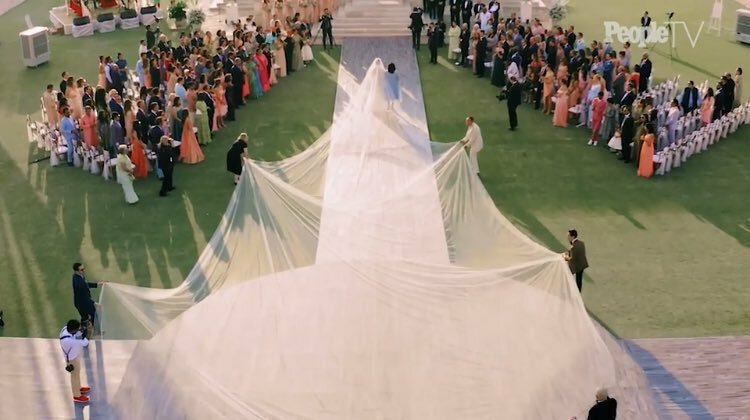 Priyanka Chopra’s 75 Ft Long Wedding Veil Grabbed Everyone’s Attention & Getting Trolled Brutally !! Priyanka Chopra and Nick Jonas had a larger than life wedding recently at Umaid Bhavan, Jodhpur. Though the pictures of the wedding were not released and use of mobile cameras was restricted, the latest updates of the wedding kept arriving in. Now yesterday, some pictures of Nickyanka’s Christian style and Hindu style wedding were officially released and they took everyone’s breath away. 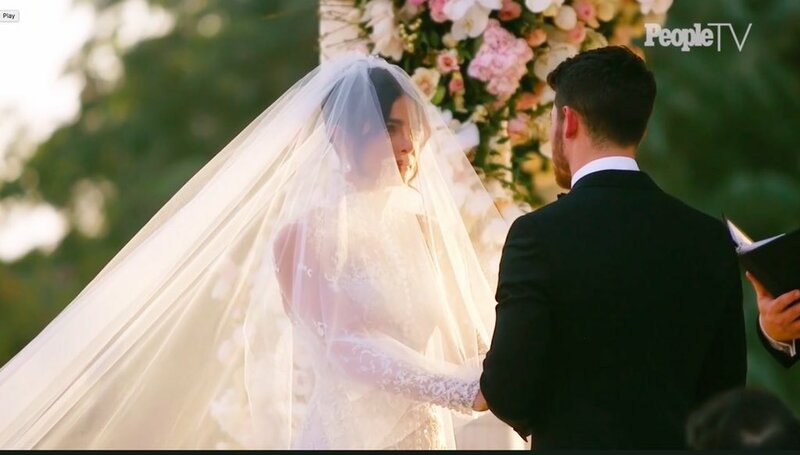 The mesmerising pictures of Bollywood actor Priyanka Chopra and American singer Nick Jonas’ Christian and Hindu weddings were shared by Priyanka Chopra on Tuesday and they have taken the internet by storm. For their Western wedding, the couple opted for designer Ralph Lauren’s exquisite ensembles. While Priyanka stunned in a white gown which featured floral and scroll motifs, Nick looked dapper in a custom suit by the designer. 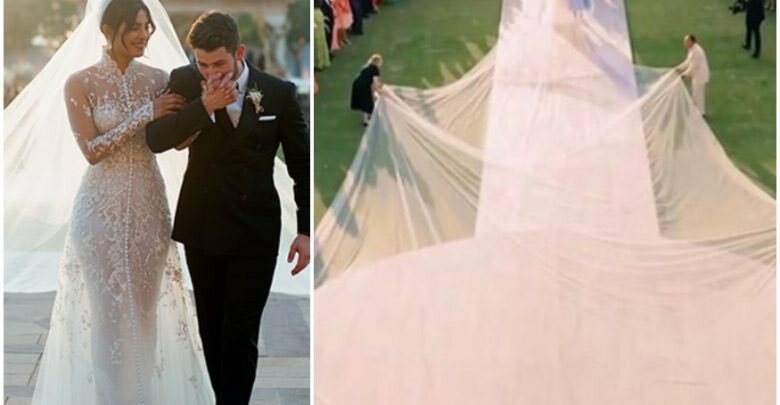 But beyond it all, it was the newlywed’s 75-feet long tulle veil that has attracted all the attention and has inspired several memes. In an exclusive video released by People Magazine, the actress looks gorgeous in a stunning white gown while walking the aisle with her mother Madhu Chopra. While Priyanka looked amazing in both looks, it was the Christian wedding look which bowled away everyone. The Ralph Lauren gown that Priyanka wore took 1826 hours to be created. It’s 75 feet vile became the talk of the social media and a lot of people made memes and jokes on it. Wow @priyankachopra veil is so wide and long I think tommorow nelayan uncle can use to do some fishing. The couple tied the knot in a two-day event at Jodhpur’s Umaid Bhawan Palace on December 1-2. After completing the nuptials, the two were spotted at the airport heading for Mumbai. The couple solemnised their relationship with a Western wedding on Saturday, followed by a traditional ceremony as per Hindu customs the next day. The duo donned Indian designer Sabyasachi Mukherjee’s creations for their Hindu wedding. Priyanka made a stunning bride in red hand-embroidered lehenga. Nick wore a hand-quilted silk sherwani with a hand-embroidered chikan dupatta and a chanderi tissue safa. The star-studded nuptials were attended by the couple’s family members, including Nick’s brothers Kevin, Joe and their respective partners, Danielle and Joe’s fiancee, Game of Thrones star Sophie Turner. The marriage comes just three months after the pair was engaged in August in a traditional Indian ‘roka’ ceremony. The pre-wedding festivities for the couple, who has been on a celebration spree ever since they kicked-off their respective bachelorettes. Previous articleThis Famous Celebrity Who Gave Voice For “Pakshi Rajan” Shares His Experience !! Watch Video !! Next articleBoyfriend Exposed The Indian Cricketer Who Texted His 16 Y/O Girlfriend In Instagram !! Check Who ! !